HÀ NỘI — Twenty eight Vietnamese students have received graduation certificates from Russia’s National Research Nuclear University (MePhI) on completion of a six-year course on nuclear technology. Five students were granted honorary (distinctive) certificates and 23 others were given good certificates. 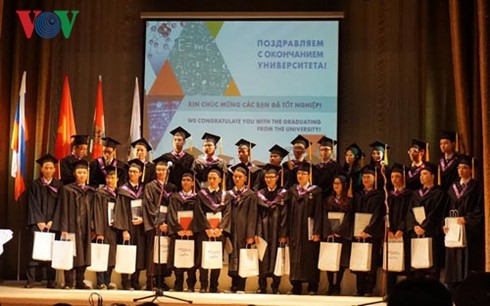 The Vietnamese students were the first international students graduating under a programme supported by Russia’s State Nuclear Energy Corporation (Rosatom). Sklyar Gennady Ivanovich, a representative from the State Duma, said Việt Nam’s decision to send students to Russia for nuclear power training was evidence of the prestige of Rosatom and Russia in the sector. Valery Karezin, director for educational projects of Rosatom’s Personnel Programme, said there were some 1,400 foreign students studying the corporation’s programmes in Russia. He said the knowledge students gained from the course was expected to help them contribute to Việt Nam’s socio-economic development.